Many of us would admit: “Our home Is often a mess and our family life is far from perfect”. “God wished to be born and to grow up in a human family. Thus he consecrated (the family) as the basic and ordinary way of His meeting with humanity.”. This is a powerful affirmation of the inherent goodness that is present in Family Life. 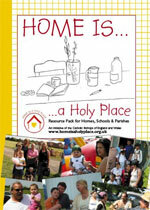 ‘Home is a Holy Place’ is an initiative of the Catholic Bishops of England and Wales. They want to raise greater awareness and understanding of the holiness of family life. Home is a holy place because God is present there as love. Home is a holy place because relationships within the family reflect God’s relationship with us. Home is a holy place because Gods presence graces all creation. To help families recognise the holiness of their everyday lives at home and to offer practical support for them to grow in this awareness. To celebrate the presence of God as love in all loving family relationships. To proclaim the holiness of our homes as places of life, love, service, teaching, fellowship, witness and prayer. Deacon Peter Lavery (Diocesan Co-ordinator for Marriage and Family Life) can supply these resource packs together with the accompanying DVDs, which feature several families from within our own diocese. He and his wife Pauline have already visited many parishes and schools to deliver these resources and demonstrate ways in which they can be effectively used. They would be delighted to accept further invitations – please see contact details below. Alternatively, they will forward the materials directly to you.